Mary is going to a birthday party and we were at a loss as to what to give as a gift, when I mentioned an art bag Mary got very excited so here is what I created. I found this great fabric with owls. The pattern is bright green and pink very girly. 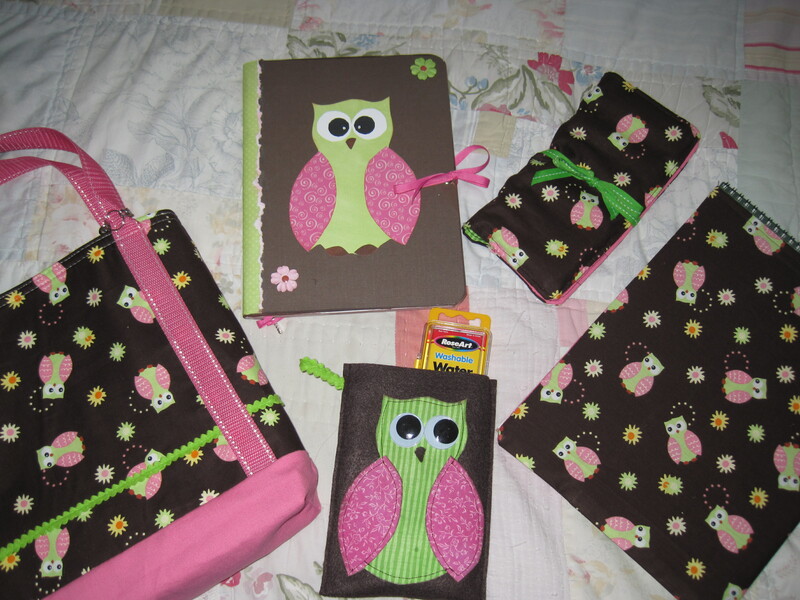 I made a bag with outside pockets for color pencils and then I altered a composition book with scrapbook paper and a larger version of the same owl for a journal. Once I got started on this I could not seem to stop. I fabric appliqued the larger owl onto a felt pocket and we inserted watercolors, then I made a sleeve with the print fabric on the outside and bright pink on the inside to slide over a sketch pad and as a finishing touch I made a crayon holder. I have had so much fun making this I sure hope Joelle enjoys it. 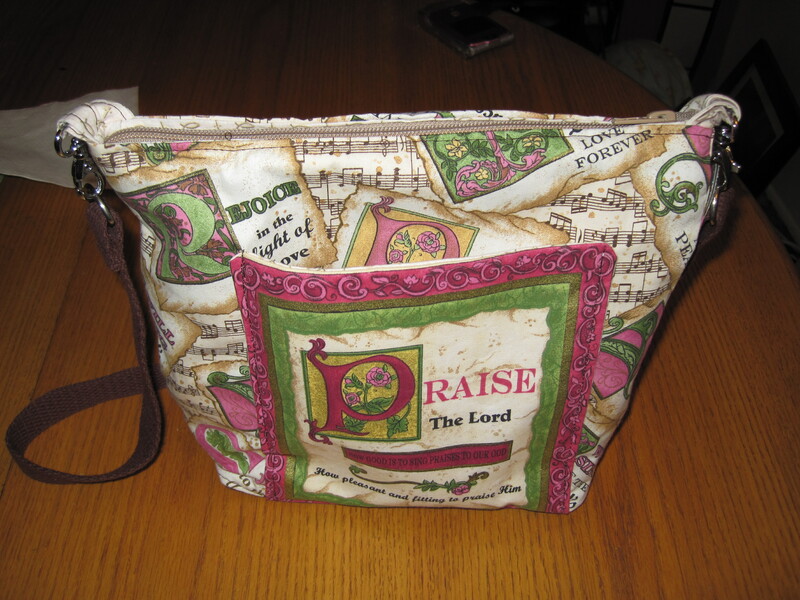 I found this blog a few weeks ago http://crafthope.com ,Craft Hope is a faith-based, love inspired project designed to share handmade crafts with those less fortunate. They have just begun a new project for bean bags and I have signed on to make a set of numbers 0-9, a set of shapes and a set of colors.I will probably make a few of extra sets for Christmas gifts and the Headstart Marc and Mary attended. 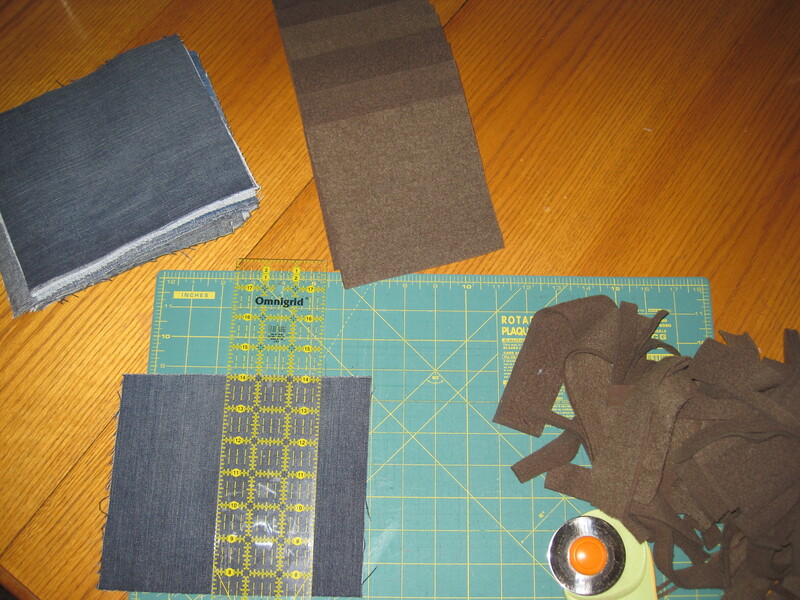 This is going to give me a chance to use up the jean pieces I have left from mary’s party as well as some of the small scraps of fabric I have wish me luck? If you are interested in joining the fun let me know or go to the link above. I have completed a new bag for Mom Karen told me Mom had pretty much grown out of te bag she has been carrying so I volunteered to make one while I was visiting at Christmas. I got Mom to tell me how many pockets and what kind of extras she wanted. I have put off making this because I knew there was no hurry but now that I will be visiting next week. I knew I had to get the bag done or Mom may not let me in. The bag is approx. 9″ x 9″ with a 3″bottom. It has a 6″ square pocket on the front and two pockets on the back. Inside there are 4 additional pockets to help keep everything organized. To complete the bag I attached a hook for her keys and adorable pictures of my kids. I hope mom is able to use this bag. See you all soon.